Mexico City, Mexico - His Grace Bishop Maxim of Western America made his second official visit to the Orthodox faithful in Mexico, May 8- 12, 2013, together with V. Rev. Blasko Paraklis. They arrived in Mexico City on Wednesday, May 8, 2013. During this visit, Abraham, a native of Mexico and a graduate of the St. Tikhon's Academy, served as their guide. The pastoral-episcopal responsibility of the bishop of Western America to the Serbian residents living in Mexico is expressed in the decisions of the Holy Assembly of Bishops. 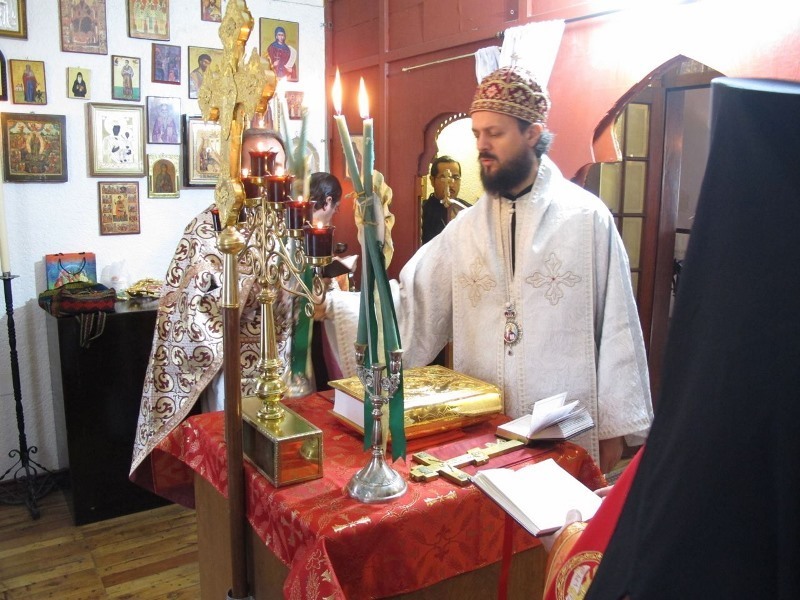 Our fellow Serbs living in this city and the surrounding areas were informed that a Divine Liturgy would be served in the coming days at Holy Trinity Russian Monastery where His Grace Bishop Maxim served on Saturday with Hieromonk Nektarije, Fr. Blasko and in the presence of a number of Serbians and the Monastery brotherhood. On Sunday there was another Liturgy at the OCA cathedral with Archbishop Alejo and his clergy.